Bytemarks Cafe – Page 47 – Serving you the first byte of science, technology and innovation on Hawaii Public Radio since 2008! After the headlines, Jay Fidel from Think Tech Hawaii tells us about an upcoming tech event called Rebuilding in 2010. We then talk to Les Iczkovitz and Nalani Manwarring from Laser Energy Works about low-level laser treatments for pain relief and non-invasive body sculpting. This show was broadcast during the fall pledge drive, and is therefore abbreviated. After the headlines, we’re joined by Francios Rogers from the Blue Planet Foundation to talk about the Blue Line Project. We then talk to Benny Ron from UH and Glenn Martinez from Olomana Gardens about Aquaculture and Aquaponics. This show was broadcast during the fall pledge drive, and is therefore abbreviated. After the headlines, Robert Hirokawa from the Department of Health tells us about the Hawaii Health Matters dashboard. Then, Greg Kim from Virtual Law Partners and Jonathan Roberts from the UH Office of Technology Transfer and Economic Development (OTTED) will join us to talk about intellectual property. After the headlines, Bee Leng Chua talks about her new role at HiBeam. Then, Capt. Jeff Breslau and Lt. Commander Chuck Bell from PACOM join us to talk about social media in the military. NASA shifts its sights from small crater to the large crater next door – NASA has changed the target for its Lunar Crater Observation and Sensing Satellite, or “LCROSS,” mission, in which the LCROSS probe and it’s spent rocket will be crashed into the moon next Friday. National Science Foundation awards $23 million to UH for EPSCoR program – The National Science Foundation last week awarded $23 million in two grants to the University of Hawaii. Hoku and Tianwei Announce Financing Agreement – Hoku Scientific, a Hawaii-based tech firm that bet big on the polysilicon manufacturing business, announced yesterday that one of its largest customers has taken a controlling interest in the company. After the headlines, Vu Bui of The Bui Brothers tells us about a “Photo Fusion” workshop. Then, Jared Kuroiwa of KGMB9 joins us to discuss how technology and social media are transforming the television newsroom. Hawaii Health Matters – A new website has been launched to provide current, varied information about the health of our island community. UH Mānoa’s IfA announces world’s largest-ever meeting of astronomers – The world’s largest meeting of professional astronomers is coming to Hawaii. Introduced Japanese white-eyes pose major threat to Hawaii’s native and endangered birds – A recent increase in the numbers of Japanese white-eyes (majiro) that live in old-growth forests is beginning to threaten native species. Cellphones and iPods go to the field to help study nature – Scientists are turning their attention away from specialized, customized equipment, and looking toward the increasing prevalence of cellphones and iPods as a way to usher in a new era of environmental monitoring in remote places. After the headlines, we talk with Lisa Gibson from the Hawaii Science and Technology Council to tell us about an upcoming tax workshop for high tech companies. Finally, Russ Ogi from Rapid Technology and Sherilyn Lau from the Hawaii State Department of Education join us to talk about 3-D printing and rapid prototyping. Scientists report adulthood body size associated with cancer risk: A team of scientists led by an assistant professor at the University of Hawaii at Manoa’s Cancer Research Center of Hawaii has reported that body mass in younger and older adulthood, and weight gain between these life periods, may influence a man’s risk for prostate cancer. NASA’s LCROSS Reveals Target Crater for Lunar South Pole Impacts: NASA has selected a final destination for its Lunar Crater Observation and Sensing Satellite, or LCROSS, after a journey of nearly 5.6 million miles that included several orbits around Earth and the moon. Most Distant Supermassive Black Hole: University of Hawaii astronomer Dr. Tomotsugu Goto and colleagues have discovered a giant galaxy surrounding the most distant black hole ever found. Hawaii researchers explore previously unseen coral: Scientists over the past month explored coral reefs in the remote Northwestern Hawaiian Islands that until recently were considered too deep for scuba divers to reach. During our news segment Glen Nakafuji from Oceanit talked about their newly awarded National Transportation Safety project. The project has a broad scope and requires the company to hire project managers and technical staff. If you are looking for a job at a very progressive technology company, you should check out Oceanit’s job postings. Ray Kakuda from Clearwire was on to give us an update on 4G Broadband Wireless service. Clearwire is rolling out WiMax in their key markets across the country. 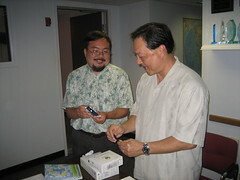 On Nov. 1st Honolulu will start to get commercial WiMax. Access speeds are reported to be comparable to cable modem and DSL rates, multi-meg downloads and 1 meg upload. We will report back actual speeds once we get our hands on the actual service. Expedition to extinct Papua New Guinea volcano unearths new species Here is a video of the giant rat talked about in the article. There was a YouTube video but that is evidently no longer available. This video is a photo sampling of the variety of new species found on the expedition. Further study on irradiator ordered To follow the trail of produce like papaya from local farmer to out of state markets is very interesting and probably not fully appreciated. In order to sell produce to out of state markets, Hawaii needs to 1) eradicate all the fruit flies or 2) thoroughly clean the produce. Mike Kohn from Pa`ina Hawaii is proposing an irradiation solution. Check out his website for his perspective on irradiation. Also Kayla Rosenfeld of HPR produced this news piece on the project. After the headlines, Ted Peck from DBEDT tells us about the Asia Pacific Clean Energy Summit. Then, Scott Wilson and Peter Vincent from AIA Honolulu join us to discuss “light rail” as an alternative to the city’s elevated rail transit plan. After the headlines, we hear about the Aloha On Rails conference from organizer Seth Ladd. Then, Jeff Mikulina and Gary Gill from the Blue Planet Foundation join us to talk about their work and vision of Hawaii’s clean energy future.